Kings Ridge is an active adult community situated in the hills of Clermont, Florida. This gated 55+ community features mature landscaping spread throughout 15 intimate neighborhoods. It is located on Highway 27, just three miles south of State Route 50. Kings Ridge Publix shopping plaza is a convenient shopping center with golf cart access, and there are several shopping and dining options just a few miles away from the community. Golf is definitely one of the major attractions at Kings Ridge. There are two courses on site: the North course and the South course. Almost half the homes in the community border one of the two 18-hole golf courses. Residents can choose membership for the North course alone, or for both courses. For activities besides golfing, the multi-million dollar clubhouse provides many amenities and is always bustling with activity. The Royal Club features a fitness center and aerobics room that offer health classes such as aquasize, Yoga, and flexible strength. Residents can get together for a relaxing game of billiards or cards, or enjoy some arts and crafts in the hobby room. A ballroom sets the stage for professional and neighborhood productions, as well as regularly scheduled social events. Outdoors, residents can relax in the swimming pool and spa. Tennis facilities, shuffleboard, pickleball courts, and bocce ball courts are on hand for some friendly competition.The North Spa is a great and relaxing area for adults only. This facility offers an exercise room, steam rooms, two outdoor pools, a spa, and cabanas. There is also a BBQ grill that's great for poolside parties. Locker rooms and a pro shop are also available. The two golf courses can be utilized exclusively by residents three days per week. Golf memberships are available as well as daily fee programs. The 18-hole, par-70 South course was designed by Lloyd Clifton. It is not a very long course, but designed to challenge the golfer to use every club in the bag. The 18-hole, par-57 North course is shorter than the South course and was designed by Ron Garl. It has two water holes and many severe sand traps with lots of elevation changes. Construction started in 1995 and was completed in 2000 by Lennar. All of the 2,088 homes in this community are single-family homes. Sizes range from 980 to 2,560 square feet of living space. Houses are available on a resale-only basis and most feature two bedrooms and two bathrooms, with some models featuring three bedrooms and two baths. Residents love these homes for their open floor plans and low-maintenance exteriors. Many homes sit on oversized lots or have golf course views. Some homes have three-car garages. Homes include professional home maintenance, including scheduled exterior home painting. Association dues also include 24 hour guarded gate, basic cable, complete lawn care, and use of the clubhouse. Residents of the community enjoy a resort lifestyle all year round. Life at Kings Ridge also offers many social activities. A full-time activities director is on hand to plan events such as charity dinner-dances, clubs, organized trips, cruises, bus rides to malls and more. There are dozens of established social clubs at Kings Ridge, with the following interests represented: ethnic groups, card games, performing artists, hobbyists, book lovers, bible study, computers, cruisers, photographers, historians, investors, golfers and other sports. Clermont also offers attractions of interest. The most popular ones are Diamond Players Club Clermont (golf course), Lake Louisa State Park, Florida Citrus Tower, Presidents Hall of Fame, Lakeridge Winery and Vineyards, and Showcase of Citrus where visitors can pick their own oranges. Kings Ridge is only 35 minutes from the Orlando airport, and 30 minutes is all it takes to get to Orlando, where all the attractions at Walt Disney World are sure to excite grandchildren who come to visit. However, Orlando offers much more, especially fine dining and shopping. In addition, attractions such as Gatorland, the Orange County Regional History Center, Pirate's Dinner Adventure, and the Charles Hosmer Morse Museum of American Art are sure to appeal to a variety of visitors. Kings Ridge in Lake County, Florida has everything active adults want or need. The Royal Club is the main clubhouse for all residents of Kings Ridge. The Royal Club - 25,000 Sq. Ft. The North Spa is exclusively for adults only. There are plenty of activities available in Kings Ridge. Here is a sample of some of the clubs, activities and classes offered here. The Prince Phillip Series offers three models ranging from 1,066 to 1,329 square feet of living space. Each model has at least two bedrooms, two bathrooms, and an attached garage. The Cottage Series offers two models with 1,150 or 1,205 square feet of living space. These models have two bedrooms, two bathrooms, and a two to two-and-a-half-car garage. The Sir Walter Series offers four floor plans ranging from 1,363 to 1,679 square feet of living space. Each model has at least two bedrooms, two bathrooms, and an attached two-car garage. The King Arthur Series offers seven floor plans ranging from 1,716 to 2,012 square feet of living space. Each model has at least two bedrooms, two bathrooms, and an attached two-car garage. These models also all have a den that can be used as a home office or entertainment room. The Castle Series offers four floor plans ranging from 2,004 to 2,560 square feet of living space with at least three bedrooms, two bathrooms, and an attached two-car garage. These homes are among the largest offered in the community. It's been almost a year since we moved in and if anyone states their nothing to do here in Kings Ridge of Clermont they must not be looking. We have found that KR has what they state on the website, from clubs (about 150+ and numerous ones for everyone - if there isn't a club just ask if you can start one and you may find others to join you. One of the biggest highlights are the Great neighbors and GREAT FRIENDS we made and all you have to do is say HI and let the process begin. Outside activities - Golf (2 - 18 holes courses) , Tennis, shuffleboard, Bocce, etc..
Let's not forget the HELPFUL Office & Maintenances staff they Work hard, answer questions. Most of all we consider them Great Friends. So if your looking for an over 55 community stop by, take a look for yourselves and join in the fun and relaxation. If you want paradise, Kings Ridge is it! It is beautiful lush community, perfectly maintained.My wife and I have looked all over Florida for the best place for us to live and we knew from the first time we saw Kings Ridge we thought we could be very happy here, and if you want.there all so many activities, and so many clubs you could definitely find something to your liking, two golf courses and a practice range.Shopping is nearby just outside the gate,there is Public, a hair salon,Mexican restaurant,gas station,very convenient, and lots of other shopping and restaurants close by.We met some great people as soon as we moved in! Very kind and caring and helpful neighbors,We've lived here a little more than a month and it feels like paradise for us.The buying process which Mary Mateo from 55places did all the work for us ,and more was so easy for us,she was perfect in every detail, and Mary continues to keep in touch,after all was said and done! We owe a lot to Mary Mateo, she has helped and continues to help our lives, fantastic person,a genuine friend,we have found paradise here in Kings Ridge. We have bought over a dozen homes. This purchase was by far the easiest yet. 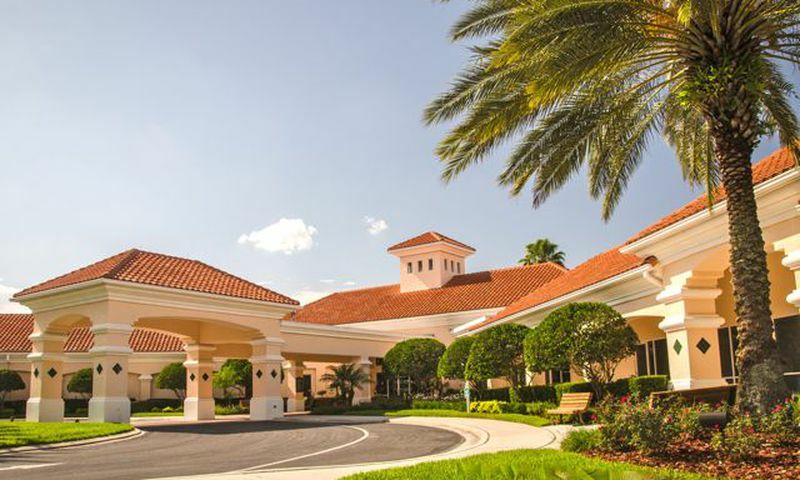 Central Florida is a beautiful area with many choices of retirement communities. I checked out several in the area, but Kings Ridge had everything I needed and more. Even though I am not a golfer, I enjoy the beauty of the courses everyday. The clubhouse and the north spa have much to offer. I chose the Whitehall neighborhood. I love the private courtyards that each home has in Whitehall, and they are the only neighborhood that has their own pool and tennis courts. That neighborhood is also very accessible to the shopping plaza. I have only lived in Kings Ridge for a couple of months, and have already made several new friends. I look forward to getting involved in Clubhouse activities, and have already used the workout room. In Kings Ridge, it feels like you are on vacation everyday. Kings Ridge was my #1 choice after visiting many 55+ communities in Central Florida. Then it was a matter of finding the ideal location and house within the community within my price range. My 55 Places Partner Agent quickly related to what I wanted and the rest is history. The Kings Ridge facilities are very impressive and a major deciding factor was how Kings Ridge takes care of your yard area, maintains your sprinkler system using reclaimed water, paints the exterior of your home every five years, provide basic cable TV, etc. for a reasonable monthly fee. The bottom line is I could not be happier with my decision! We have found a Haven at Kings Ridge. The facilities and people there are the best. We make new friends every day. The community is made up of both elderly and young at heart folks. Very active. Our 55 Places agent was very patient and thorough in helping us and guiding us through the whole process with no pressure at all. This beautiful 36 hole gated, warm, friendly community is situated in the Hills of Clermont (highest point in Florida)5 minutes south of Hwy50 on Hwy27. Both coasts are 1.5 hours each way, Miami 3.5hrs and Key West is 6.5 hours. The city of Clermont is growing wonderfully. KR is 10 minutes from Old Clermont and most surrounding stores circling 27 & 50. Major malls are east 15 minutes (Wintergarden) to 30 minutes (Millinia) and Orlando Airport (MCO) is 40 min east. There are 3 entrance & exits, North (Main), South (mall) and East. The south gate is connect to a small strip mall with Publix, Empire Liqour, Pix Gas, Sun Trust, MacDonalds, CVS, Walgreens and many other businesses. North on 27 towards 50 (and on 50) you have many well known businesses, restaurants, stores, movie theatres and much much more. Everthing is so close it's really and truly unbelievable. All the staff are courteous, helpful and put one interesting events. There is the North Club and South Club Houses. The North have a salt water wading pool and fresh water lap pool where the South (main clubhouse) has a large pool with 2 lap lanes and an outside wirlpool. The South also has patio covered bbq's for your special occasions and all the happening events in the main club building. The courses and grounds are very well maintained. Your neighbors are friendly, caring and watchful. Legends is across Hwy50 and The Villages are 15 min. north. Please look us up on Google Maps to get a better view picture and I hope these few words are inviting. See you on the 18th hole! Kings Ridge offers tons of activities, nice amenities and welcoming neighbors. I moved in about 6 months ago and have already made some great friends. I participate in lots of the activities like bingo, ceramics, bridge, knitting and scrabble. This fall I plan to do some volunteer work in the community and want to do more extended trips with the travel group. 55places.com is not affiliated with the developer(s) or homeowners association of Kings Ridge. The information you submit is distributed to a 55places.com Partner Agent, who is a licensed real estate agent. The information regarding Kings Ridge has not been verified or approved by the developer or homeowners association. Please verify all information prior to purchasing. 55places.com is not responsible for any errors regarding the information displayed on this website.